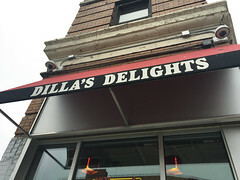 I had first happened across Dilla’s a few days earlier: located in the end of an apartment building, Dilla’s is in a wedge-shaped storefront resulting from the intersection of the Grand Circus’s radial streets with the linear streets of the regular Detroit grid, making for a ~25 degree angle store. 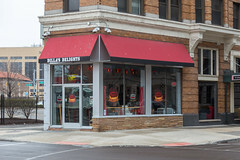 The name is a tribute, the owner named the bakery after his nephew, the late rapper and record produce rJ Dilla who was a rising star in hip hop before dying of a rare blood disease (after, ironically, releasing an album called Donuts), and who even used to live in the building above when it was the Milner Hotel. 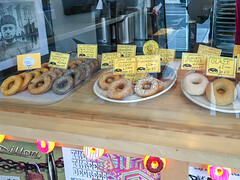 Dilla’s uncle, Herman, has been making and distributing donuts around downtown since 2013 (indeed, I think they do the donuts for Roasting Plant, one of my favorite downtown coffee stops), but in 2016, finally had a chance to open up a storefront. For those looking for a wide menu of food options, this isn’t really the place for that: the menu here is almost entirely “donuts”, but they make up for it with both quality and variety: on my visit, they had over 16 different donut varieties. Some of these are the classics: the John Doe (plain cake donuts), the Conant Street (basic glazed), or the Beverly Bavarian (classic cream-filled donut), but they’ve also got more than a few interesting varieties, including the McNasty Macaroon, the Cake Boy with chocolate ganache, the Beat Street blueberry, or the Banana Bread. Grabbing an assortment of donuts, I was on my way. The two I ate were a Beverly Bavarian (shown) and a Conant Street. Both were great examples of classic donuts done well: the Bavarian was light, fluffy and airy inside, with a crispy exterior, a pleasingly smooth and vanilla-rich custard, and an immaculate chocolate glaze. 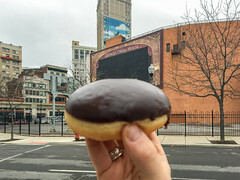 The Conant street was a similarly airy and crispy donut with a perfectly applied glaze that still had a slight crunch to it (one of the great challenges with glazed donuts is serving them before the glaze absorbs moisture). Overall, Dilla’s was a nice little spot. The donuts were spot-on perfect (and well-received by the folks at Ford Field), the staff friendly and conservational, and it’s a nice little addition to the neighborhood. And a fitting tribute to the late musician as well! Every once in a while, instead of the standard restaurant review, it’s nice to take a few steps back and discuss broader food topics, or those sorts of things that don’t really lend themselves to a review, per se. With this being my first visit to Britiain since 2008 during "summer" (in this case, the trailing edge of it), I was able to finally try one of those British traditions of summer, the "99 Flake". Okay, at this point, my UK readers are probably saying to themselves, “Great, now he’s rambling on about 99 Flakes. What’s next, the finer points of Jaffa Cakes?” While my US and other readers are probably asking themselves, “WTF is a 99 Flake?” Well, the 99 Flake is a standard British dairy treat. At it’s most basic, it’s basically what us Yanks call as soft serve cone, with a large dollop of soft serve ice cream served on one of those wafer cones. And, to top it off, the very pièce de résistance is the insertion of a half-length Cadbury Flake into the ice cream.